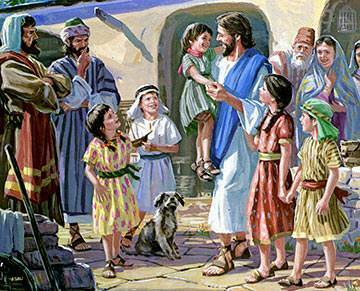 When Jesus left Nazareth to go on His journeys He made friends with the children in the villages through which He passed, and when they knew that He was coming that way again, they would run to welcome Him. In one of these villages there lived a little girl and boy whose names were Ruth and John. They had a baby brother too, who was very small. His name was Peter. Ruth and John knew all about Jesus, for He had been to their village before, and they were always asking, "Mother, when is Jesus coming again?" "Some day," mother would say. "You must have patience." One day Ruth and John were very sad, for Baby Peter was ill. No one knew what was the matter with him, but he just cried and cried. Ruth sat on a mat in the cool shadow of the house, swaying him gently in her arms, and singing to him, but he still cried. John went sadly down the street to look for one of his friends in the marketplace. Soon he came running back as fast as his legs would carry him, shouting, "Ruth, Ruth, who do you think is in the marketplace?" "Who is it?" asked Ruth. "Why, Jesus has come," cried John. "You must come and see Him." "I can’t," replied the little girl sadly, "because I have to look after Peter, and mother is busy." Then the mother had a wonderful idea. "Suppose we all go, and take Baby Peter too. Perhaps Jesus will make him well again. Don’t you remember when He was here before now He healed the farmer’s little boy, and made the blind beggar to see. I’m sure he will help us." 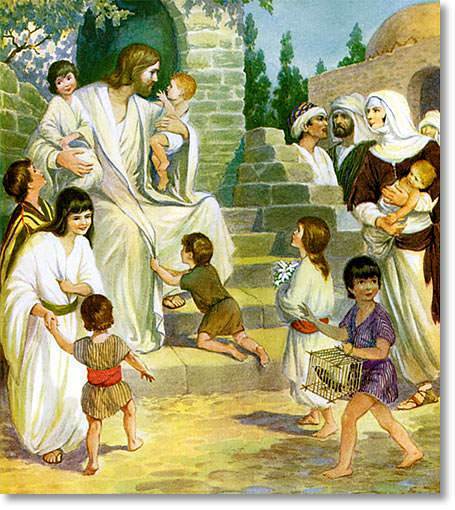 So mother cuddled Peter up close, and they all hurried away to the marketplace. Oh, what a crowd was there! All the men in the village had left their work and were standing listening to what Jesus was saying. There were some other mothers with their children too. Ruth and John could not see Jesus at all, so they tried to get in between some of the men; but mother could not follow because she was afraid her baby might get hurt. 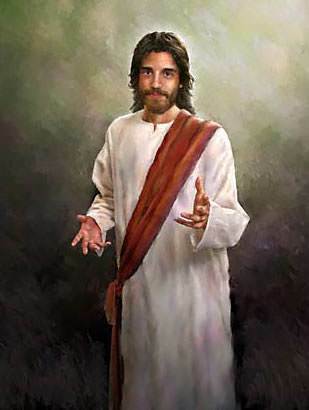 Some of Jesus’ friends heard the scuffling and turned around angrily. "You can’t come here," one of them said. 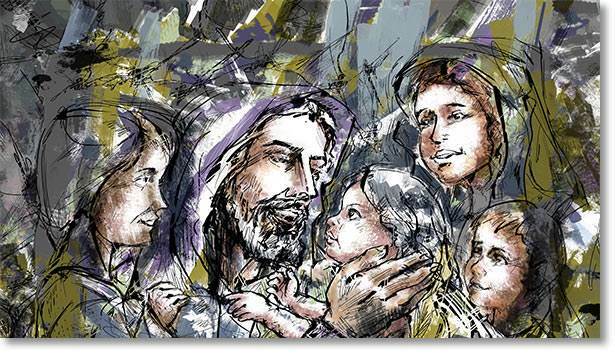 "Jesus is too busy to bother with children just now." Mother looked sad, and Ruth began to cry. 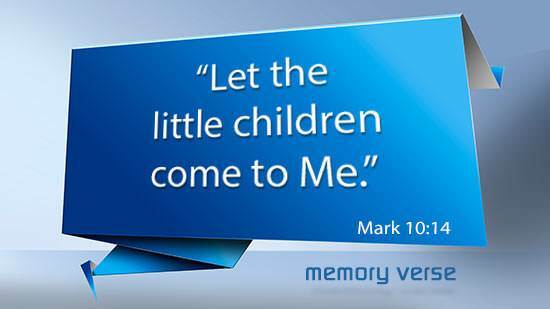 Then they heard a kind voice saying, "Let the children come to Me; do not stop them." The next minute Jesus was holding Ruth in His arms, and drying her tears. She soon began to smile, and when mother told Him why they had come, He put His hand on the baby’s little head, and said, "Don’t worry, he will soon be well again." How happy they all were as they went home. 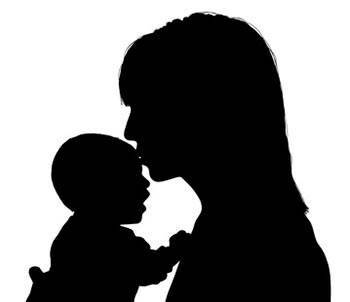 The baby was sleeping quietly in mother’s arms now, and the colour had come back into his pale cheeks. 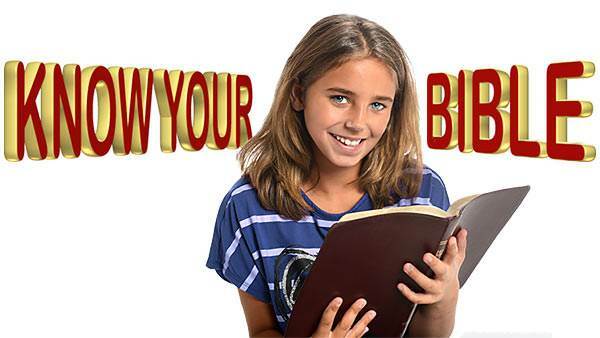 "Jesus is our big Friend, isn’t He, mother," said Ruth. 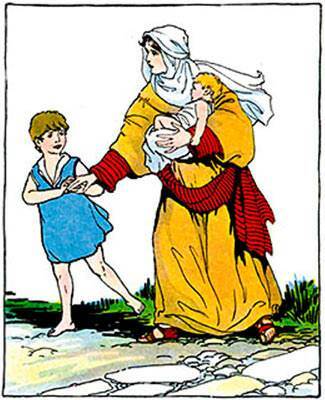 "Yes," replied mother, "and you must be His friends too, and help Him when you are old enough."